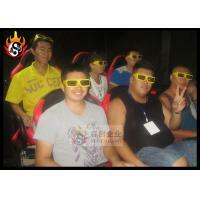 1.High quality 4D cinema system with hydraulic 4D motion cinema seats. 2.Hydraulic cinema chair with stop button. 4D cinema is a new digital technology based on the technology of 3D cinema. It is a newly raised international movie style which has been developed from the basis of traditional stereo cinema. Compared with cinemas of other types, it boasts features and advantages of prominent theme, high technology, vivid effect and viewer-attracting. It can bring the viewers strong incentive on visual, listening, touching or even smelling sensation, and bring an all-round feeling to all the sensory organs. How can you make profit from the 4D cinema system? For instance, design picture album for publicity, go to malls, amusement center schools or other high-flow region. And design discounts activities for opening up, experience activities free of charge annd so on. Make special cash coupons loved by families, couples, students and other groups, and the coupons can be used as cashes. Interact with large malls, for instance, give five-yuan coupon to customer who buys goods worth 100 yuan at least. Paste posts or play video in open areas, or throw leaflets(used as cash coupons) in downtown streets. Team tickets: 50 members a team: $1.6/ PCS, the original price is $3.2. Student ticket: $0.8/PCS, the original price is $3.2. Couple ticket: $4.8/ 2 PCS, the original price is $3.2/PCS. Family ticket: $4.8/3 PCS, the original price is $3.2/PCS. 1. Senchuang enterprise is a professional manufacturer specialized in producing amusement machines since 1999. We have enjoyed rich experience in this field for more than 12 years. With considerable service and competitive prices, Senchuang is your best choice. 2. We adopt advanced technology of hydraulic power from South Korea, producing not only stimulating movements, but also wonderful rhythms. 3).We have gained very good reputation from overseas customers with our high quality system. After receiving orders from customers, our company strictly controls the quality of products from purchasing raw materials to production, providing you with qualified products at the first-class level. Meanwhile, in order to ensure the quality, we will test all the products before delivery.